Want to get bloggers “buzzing”? Sell your blog for big bucks. That’s what happened when John Wu sold his Bankaholic blog to Bankrate for a cool $15 Million. Talk about a Blog Success Story – a blog that is less than 2 years old created a huge payday for John. If you’ve been blogging for more than a few months, you may be wondering what makes the Bankaholic blog worth so much money. After all, the blog doesn’t get very many comments and there’s very little “community” on the blog – yet the Bankrate blog raking in a record setting payday for the blog’s developer. The key to blogging success is simple: KEYWORDS. The Bankaholic’s blog expertly targets the right keywords – the keywords a mega-site like Bankrate wants. If you’ve run a PPC campaign lately, you’ll see where the $15 Million dollar price tag for a blog that ranks well on highly sought after keywords might actually be considered a BARGAIN! When successful bloggers share the source of their blog traffic – without exception the primary source of their blog traffic is via the search engines. Keywords are how the search engines determine where to place you in their giant indexes. Understanding and using the right keywords for your audience is an essential part of achieving blog success. When you create great and creative blog post titles with keywords in mind…you’ll be well on your way to achieving true blogging success. The Bankaholic blog sale was announced when I was in the middle of doing a follow up with one of my 8 Week Power Blog Launch customers. This client asked for a faster, easier way to fix his blog. (Turns out, people want to fix their blogs in 30 minutes or less, not 8 weeks. Mock Horror and Surprise!). As I was in the middle of creating this “Fast Blog Fix” report, the Bankaholic sale was announced and I put my 30 Minute system to the test. I applied the principles to the Bankaholic blog as well as a couple of other blogs – and the results are revealed in “Fast Track to Blog Success”. Tired of hastily prepared video tutorials that you can’t follow? Want to work at your own pace? 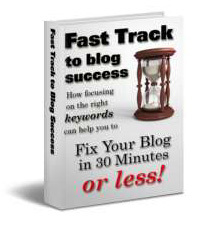 The Fast Track to Blog Success is delivered in eBook format so you can print it out, set it on your computer desk and refer to it as you work at your own pace. In the Fast Track to Blog Success, I’ll take you step by step showing you the right way, and the wrong way, to use the right keywords to drive traffic to your blog. 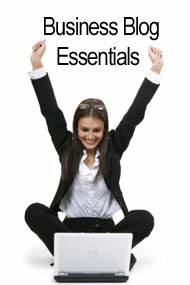 The Fast Track to Blog Success is available exclusively to Acumen Web Services clients.